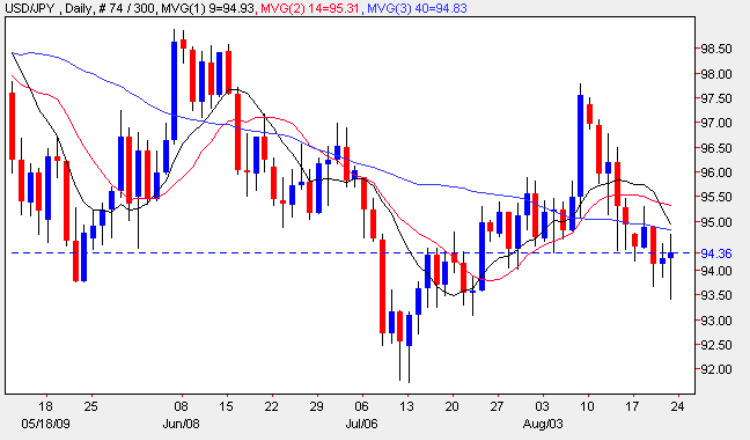 The week ended with an interesting candle on the daily chart for the yen to dollar pair, which suggests we may see some trading opportunities on Monday or Tuesday as a result, as the trading session ended on a very long legged doji, but one where the lower shadow was considerably longer than the upper, indicating a degree of bullish sentiment. Following the sharp reversal of the last two weeks, and with a deep lower wick, our forex analysis would point to a rally for the dollar in this pair today, which should give us some intra day long positions, should this signal be confirmed in the short term. However, with the strong resistance still weighing down on the pair, any profits may be short lived as the 95 technical level comes into play once again, so small profit targets are the order of the day. Bear in mind also that the three moving averages are still weighing heavily at present, so small profit targets on intra day trades with tight stop losses are the order of the day. As with many other currency pairs, there is no fundamental news for either the yen or the US dollar today, so this combination of thin trading and lack of news could lead to some volatile and unpredictable moves in the forex markets. You can keep up to date with all the latest fundamental news on the economic calendar, latest currency news and live currency charts by simply following the links. I have also included details on an excellent ECN broker.